Class Days and Times: Tuesday/Thursday, 9:00 a.m. - 11:30 a.m.
2-Day Class - Tuesday/Thursday, 9:00 a.m. - 11:30 a.m.
3-Day AM Class - Monday, Wednesday, Friday, 9:00 a.m. - 11:30 a.m.
3-Day Triangle Class - Tuesday/Thursday, 9:00 a.m. - 11:30 a.m., Wednesday, 12:00 - 2:30 p.m.
5-Day AM Class - Monday - Friday, 9:00 a.m. - 11:30 a.m.
2 Full, 1 Half-Day - Monday, Wednesday, 9:00 a.m. - 2:30 p.m., Friday, 9:00 a.m. - 11:30 a.m.
7 Session Class - 5-Day AM Class & an Enrichment Class on Tuesday and Thursday PM, 12:00 p.m. - 2:30 p.m. Registration packets must be picked up in the office and are not available on-line. Schedules may be customized. We also have some full day classes (9:00-2:30). Please call for further information. Four-year-old children: We must be notified of withdrawal (in writing) prior to June 15 of the school year for which your child is enrolled. Three-year-old children (includes Jump Start students): We must be notified of a withdrawal (in writing) prior to July 1 of the school year for which your child is enrolled. 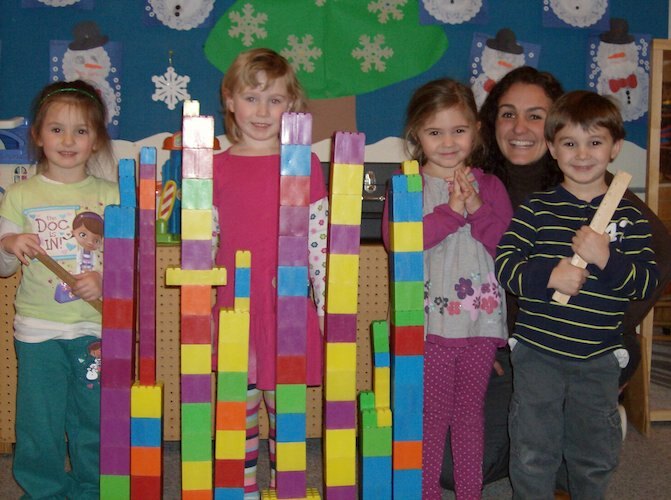 In addition to our wonderful classes, Hillsdale United offers several other great programs for your children. Sign-up sheets are in the office! At 11:30 the children eat lunch together in a classroom followed by an hour of play (12:00-1:00). Play time will be in one of these places - Rainy Day Room / Available Classroom / Playground. Check the school flyer for Pizza and Bagel Days each month! Sign-up in the office in advance. These popular Extended Hours lunches fill quickly!